*ONE DAY AND HALF DAY CLASSES WHERE YOU CAN BRUSH UP AND PERFECT YOUR UPSTYLING SKILLS. *ONE ON ONE SESSIONS WHEN YOU JUST WANT TO GET STUCK IN! 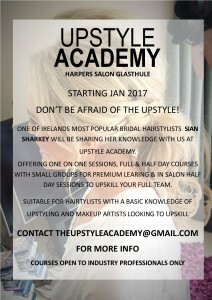 DONT BE AFRAID OF THE UPSTYLE!